The dough is thick. That’s why the recipe calls for you to mold cookies into a ball and then use fork tines, dipped in sugar, to flatten the cookies. This way the cookie will bake all the way through before the outside browns too much. Yet these cookies are shaped much like a drop cookie. In fact, you can drop tablespoonfuls of dough onto the baking sheet and then flatten them, if you prefer – the shape may simply be not as perfectly round. 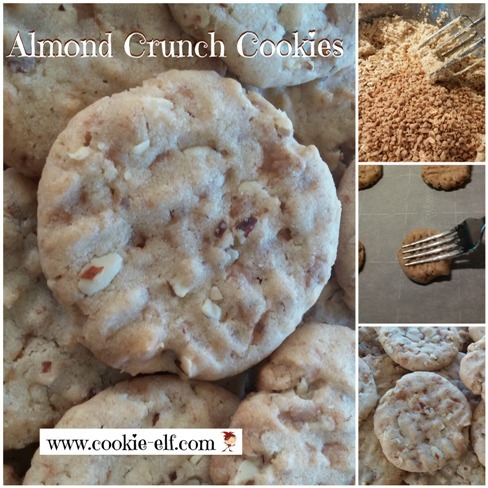 Get the full recipe for Almond Crunch Cookies. And you can see other Pillsbury Bake-Off cookie recipes on our Pillsbury Bake-Off Cookie Winners Pinterest Board. Drop cookies are spooned directly from the mixing bowl onto the cookie sheet. Use a teaspoon or tablespoon to scoop up some dough and use another spoon or rubber spatula to push the dough off the spoon onto the baking sheet. When chilled (or when stiff), dough may be formed into balls and flattened between palms. Change the size of the finished cookie by using less or more dough. 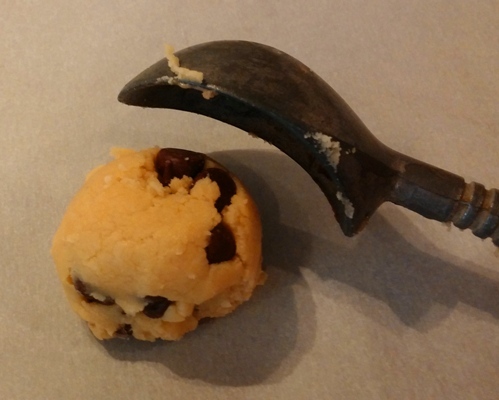 For smaller cookies, use a teaspoon. For medium-sized cookies, use a tablespoon; for giant cookies, shape the dough with an ice-cream scoop or ¼ cup measure. Adjust the baking time accordingly for size, adding a minute or two for larger sizes. Drop the same amount of dough for each tray of cookie. A uniform size allows cookies to bake evenly. Unless the recipe states otherwise, place cookie dough at least 2 inches apart on baking sheet to allow room for spreading.